Blackfeet, Chippewa Cree, Diné and Mexican. November is Native American Heritage Month and Jade Begay (Diné, Tesuque Pueblo) is the Santa Fe Found guest curator. 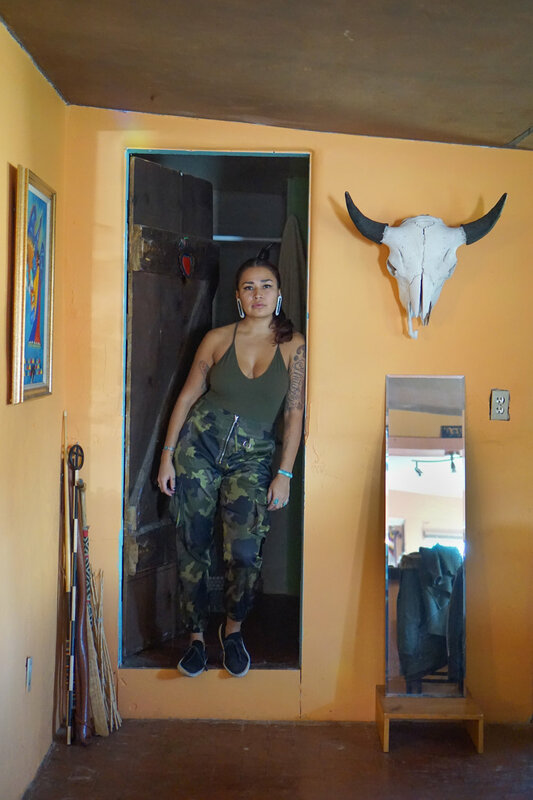 In this interview, Jade speaks with actor, filmmaker, and writer MorningStar Angeline about her experience as an indigenous woman in the film industry. While I was born in Santa Fe, my family moved to Gallup, NM when I was two, and that is where I attended elementary school and spent most of my time growing up. Through the end of elementary and into college I lived in the Los Angeles area but always spent every summer in New Mexico. In 2013 I was working in LA as a photographer and film PA when I was cast in Drunktown's Finest. It was then that my eyes were opened to the NM film industry and I found new hope in pursuing my career as an actor. I moved back to New Mexico within 3 months of wrapping the film. Since I work freelance, my life is full of inconsistencies. It can vary from 12-14 hour days on a set, or not leaving my house for a few days because I'm writing. For the last few months, I have been working on post-production for my film 'Yá'át'ééh Abiní', as well as researching for a podcast and new scripts. When I'm feeling uninspired or complacent in my work I usually collaborate with a friend or spend time alone in a new environment. I also enjoy taking care of my physical health. Right now I am still experimenting with different styles and tones of writing, and will continue to, until I find what feels most honest to my voice. I want my work to be extremely emotionally honest and invested. If someone were to look at my eclectic (and very short) body of work, I would hope that the access to emotion is at least consistent. That my work feels honest, even if the delivery of said honesty could use some work, is important to me. I am most proud of my short film, Yá'át'ééh Abiní. I think mostly because it was birthed out of the most horrible thing I've ever experienced - losing my dad. It's still hard to believe that I was able to write something that encapsulated my relationship with him, who he was, and his death, in a way that other people related to and supported. It is definitely the most vulnerable I have ever felt in my work. I suppose I am most proud of it because there was a time when I didn't think I'd make it out of that period of my life alive, let alone with a story to tell. That is my story of resilience. Gabriel Mozart Abeyta, a good friend of mine who was also born in Santa Fe, recently shot a short film in Nashville, TN, called 'Without a Darker Reflection'. It was definitely my favorite role to act in and Gabriel had tremendous faith in me as the role of Bea. The lead in the film is Gethin Anthony who was an absolute pleasure to act with. It's ultimately a story about a man's journey to self-acceptance and love through parts of his personalities personified by myself and other actors. I am so excited to get to share this movie when it is finally completed. I love that acting, writing, directing, or filmmaking can be all very collaborative. I love that these areas of work require an immense amount of private, introspective work while also needing another's help in order to fully come to life. I also love seeing the many ways in which people digest this work. Traveling with the films I've been in and discussing with various audiences countrywide has been a privilege and inspiring. What makes this place, these Tewa lands, special to you? What are your favorite things about this place? I love the land and how much time I have to think here. I feel more relaxed here than I have anywhere else I've ever lived. Living in Los Angeles definitely gave me the time away that I think I needed in order to truly appreciate this landscape and skyline. I love that I have a strong community of Native and Indigenous friends and colleagues and that I am within short driving distance to where I attend ceremonies and have family. I also just love the architecture and artistic inspiration that seems to lurk at every corner. Can you talk about the ways that you integrate/weave in your cultural identity/indigeneity into your work? I am extremely protective of my Native identity and culture which I know has a lot to do with how I was raised. The industry I work in holds no space for my indigeneity except for as the bullet point on my resume. It is a selling point at times and a disadvantage at others -- it all depends on a variety of factors. I have learned that the parts of yourself that you give to this job, especially culturally, can/will be taken and misunderstood or even misused. I firmly believe that there are things, places, people, etc. which should not be recorded in any manner, even if I, as a member of said community, do the recording. With that said, my cultural identity is a huge part of who I am so I cannot exclude it from my work. I write to provide more representation for the stories that run similar to mine, and I act because I longed to see someone with skin or features like me when I was little. Film is a beautiful medium because of its power to provide intimate accounts of perspectives and lives that we normally wouldn't get to see, let alone relate to. I do not want non-Natives to watch my films and walk out feeling like they know what it's like to be a Native American because that is impossible and offensive. I want them to be entertained by the film and relate to the characters and story simply on a human level. Native artists offer a unique voice to various types of art, but our cultures should not be our only selling points. Do you feel that the entrepreneurial scene in Santa Fe is inclusive to the Indigenous community and is active in Native/Indigenous issues? Why or why not? I think the scene is inclusive but has problematic contingencies in place. Many of my friends who work in the arts all feel that their work isn't appreciated or even given attention unless it is framed specifically through a Native lens. This city thrives on what it perceives traditional Native art as - pottery, paintings, etc. that all depict Natives as chiefs, spiritual beings with ties to nature and animals, etc. when we are very contemporary peoples. It can be very frustrating when we feel we have so much more to share than those specific perspectives. We are currently in #NativeAmericanHeritage month. Beyond just honoring Native people, I believe this month should also be about decolonizing our minds/hearts/souls. What are some ways people can "decolonize"? When having a dialogue about decolonizing, I think it's very important to start with ourselves and checking the amount of privilege and misogyny we bring to the table. Even as a cis-queer Native woman I find myself having to unpack and find ways to unlearn the internalized misogyny and prejudices I carry. I see countless other friends and families doing their best to do the same but it takes time. Healing is a huge part of decolonization... It can be very hard to contribute to our communities in productive and healthy ways when we conduct ourselves in the problematic ways we are trying to stop. For non-Natives, I think decolonizing can also mean listening and amplifying Native voices. I believe it is very easy to take on a savior mentality and that is only colonizing our communities further. One thing I think we can all do is hold members of our communities accountable, i.e. those who exhibit abuse, misogyny, racism, etc. We can no longer reward highly problematic and toxic people with our friendship, business, and praise. I think most people who are drawn to any of the creative arts find themselves without any other choice but to do the thing that fulfills them. I have seen the power of this medium time and time again, and it inspires me to do and be better as a person, let alone a filmmaker. At the end of the day, I feel like this career path is limitless because of how many different ways one can tell a story with this medium and the many stories that still need to be heard. I not only want to express my perspective and voice but I also want to go into producing so that I can amplify other people's stories, specifically femme Indigenous peoples.